The Copiale cipher is an encrypted manuscript consisting of 75,000 handwritten characters filling 105 pages in a bound volume, found in an archive in former East Germany, at the Akademie der Kunste. It is thought to date to between 1760 and 1780, though was unknown to modern public attention until 2011 when an international team announced that they had cracked it. The manuscript includes abstract symbols, as well as letters from Greek and most of the Roman alphabet. The only plain text in the book is "Copiales 3" at the end and "Philipp 1866" on the flyleaf. Philipp is thought to have been an owner of the manuscript. The plaintext letters of the message were found to be encoded by accented Roman letters, Greek letters and symbols, with unaccented Roman letters serving only to represent spaces. The researchers found that the initial portion of 16 pages describes an initiation ceremony for an unidentified secret society related to Freemasonry. The document describes an initiation ritual in which the candidate is asked to read a blank piece of paper, and on confessing inability to do so, is given eyeglasses and asked to try again, and then again after washing the eyes with a cloth, followed by an "operation" in which a single eyebrow hair is plucked. Above are pages from the "Copiale Cipher," a mysterious cryptogram, bound in gold and green brocade paper, that was finally cracked by an international team of cryptographers. A mysterious encrypted manuscript of a secret society, meticulously written in abstract symbols and Roman letters, has finally been deciphered more than three centuries after it was first handwritten, scientists now reveal. The enciphered message, or cryptogram, revealed the rituals and political aims of an enigmatic 18th-century German fellowship, the "Oculist Order," revealing the society had a fascination with eye surgery, though it seems members of the society were not eye doctors. "This opens up a window for people who study the history of ideas and the history of secret societies," said researcher Kevin Knight, a computer scientist at the University of Southern California. "Historians believe that secret societies have had a role in revolutions, but all that is yet to be worked out, and a big part of the reason, is because so many documents are enciphered." The mysterious cryptogram, bound in gold-and-green brocade paper, dates back to a time between 1760 and 1780. Once hidden in the depths of the East Berlin Academy and uncovered after the Cold War, its 75,000 characters are written in 90 different cipher letters, including the 26 Roman letters as well as many abstract symbols. On its 105 yellowing pages, the only plain text is "Philipp 1866" on the flyleaf and "Copiales 3" at the end of the last page. 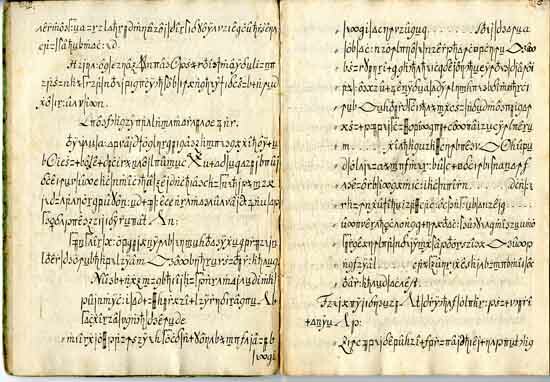 "Philipp" is thought to have been an owner of the manuscript, while "Copiales" was used to give the secret writing its name: the Copiale Cipher. To break the cipher, an international team of researchers tracked down the manuscript, now in a private collection, and transcribed a machine-readable version of the text. The investigators began not even knowing the language of the encrypted document. At first they focused on the Roman and Greek characters sprinkled throughout the Copiale Cipher, isolating them from the abstract symbols and attacked it as the real text. "It took quite a long time and resulted in complete failure," Knight said. After trying 80 languages, the cryptography team realized the Roman characters were "nulls" intended to mislead readers, somewhat like how pig Latin adds the suffix "ay" to words in an attempt to confuse listeners. It was the abstract symbols that held the message. "It was exciting to decode," Knight recalled. One idea that eventually bore fruit was that abstract symbols with similar shapes in the Copiale Cipher represented the same letter or groups of letters - for instance, the symbols with the circumflex "^" over them were actually the letter "E." The researchers also detected an extraordinarily common three-symbol cluster, which they deduced represented the letters "cht," a common trio in German. Eventually from these lines of attack, the first meaningful words of German emerged: "Ceremonies of Initiation," followed by "Secret Section," as translated. "When you get a new code and look at it, the possibilities are nearly infinite," Knight said. "Once you come up with a hypothesis based on your intuition as a human, you can turn over a lot of grunt work to the computer." These findings "may help trace the development of political ideas and the advancement of ranks within secret societies," Knight told LiveScience. As to why this secret society might have focused on the eye, "the eye is part of the symbology of secret societies," he explained. Knight is now targeting other encrypted messages, including ciphers sent by the Zodiac Killer, a serial murderer who sent taunting messages to the press and has never been caught. He is also applying his computer-assisted decryption software to other famous unsolved codes such as the last section of "Kryptos," an encrypted message carved into a granite sculpture on the grounds of the CIA headquarters, and the Voynich Manuscript, a medieval document that has baffled professional cryptographers for decades. However, the trickiest puzzle of all for Knight may be everyday speech. He is one of the world's leading experts on machine translation, teaching computers to turn Chinese into English, or Arabic into Korean. "Translation remains a tough challenge for artificial intelligence," said Knight, whose translation software has been adopted by Apple and Intel, among other companies. Knight is approaching translation as a cryptographic problem. As such, research into cracking the ciphers of obscure secret societies could improve human language translation, and possibly lead to the ability to translate languages not currently spoken by humans, including ancient languages and animal communication. [Read: Dead Languages Reveal a Lost World] "We are exploring how to make use of cryptographic techniques to make better language translation software," Knight said.